1/2 lb 5.5 x 2.75 x 1.75" 1 lb 7 x 3.5 x 2"
Buy More 1 Piece Candy Boxes Save More! 1 lb. 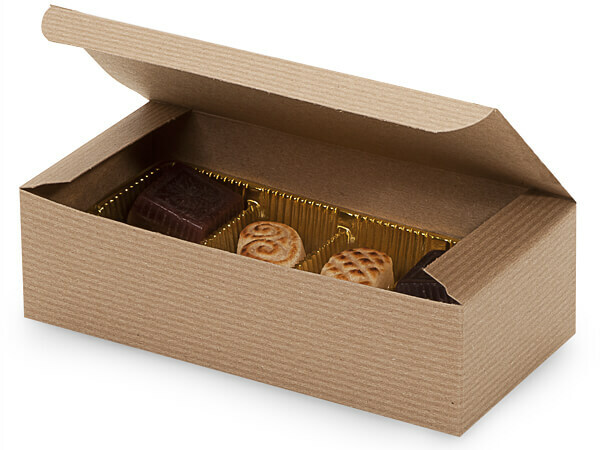 1-piece 100% Recycled Kraft Stripe Candy Boxes are perfect for candy, chocolate truffles & fudge. Exact box size is 7x3-3/8x2". Stored flat with quick semi-automatic bottoms & tuck lids. Complies with FDA regulations for food packaging. Made in the USA. Green Way ® Eco-Friendly Packaging. Yes! We can print it! Personalize your boxes with a company name and/or logo. Call our Custom Print Department at (800) 547-9727 ext. 4 for details. Our colorful 1 piece folding candy boxes will make beautiful packaging for your gourmet candy or cookies, fine chocolates & fudge. These boxes ship and store flat, and are easy to assemble with a quick automatic bottom with a simple tuck top. They comply with FDA regulations for food packaging. These boxes are printed with water based inks, so they do not have any harmful chemicals. We have these boxes available in 1/2 or 1 lb sizes in bulk cartons of 100 or small packs of 10. We added the small packs to give you the chance to try a new size or color without a huge commitment or so that you can create your own assortment of sizes and colors! You can really create your own custom look by mixing the colors!